For those who lived the high life of Hollywood Showbiz back in the halcyon days of Humphrey Bogart, Lauren Bacall, Frank Sinatra, Dean Martin and Sammy Davis Jr. money was mostly no object and life was able to be lived almost as hedonistically as one might desire. So when one’s Hollywood friends of the exclusive “Rat Pack” decided to buy themselves a new Stutz Blackhawk as Dean Martin did then came the difficult choice of what car to buy. Just imagine poor Sammy Davis Jr. thinking “… the Stutz, the Rolls, or perhaps a Ferrari … life is full of hard choices…”. Although he owned a Stutz from 1973-4 Sammy Davis Jr. decided to update to a Rolls in 1977. But then of course he wanted the most exclusive and expensive Rolls-Royce the helpful people at Bill Harrah’s Modern Classic Motors of Reno, Nevada could offer. That car was a top of the line Rolls-Royce Camargue which at the time was painted two tone Tudor Red with a Masons Black lower body. Upholstery was in Nuella Black 5000 leather with black carpet and gray headlining. The gray headlining does not discolor from cigar smoke quite as quickly as a lighter color would. 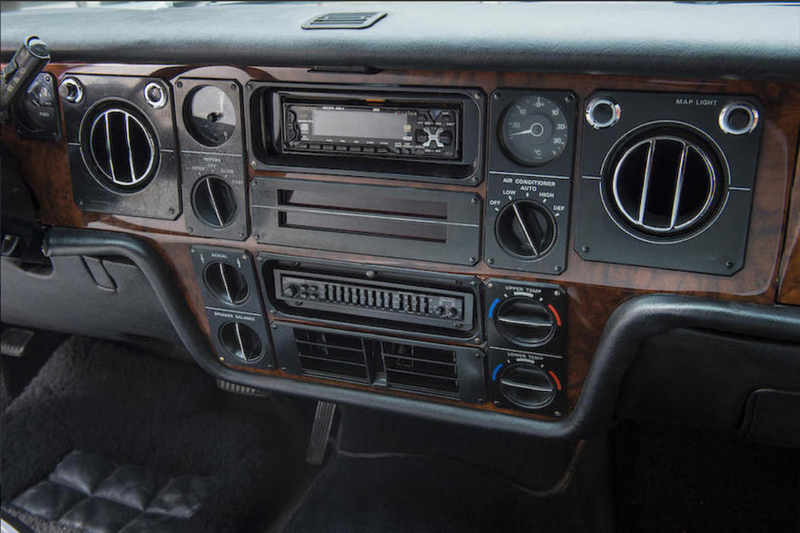 Black seats and black carpet with black instruments; the blackness broken only by the gorgeous wood dashboard and trim. The Rolls-Royce Camargue was something of a styling enigma. People either loved it or didn’t. Styling was done by Paolo Martin of Italian design house Pininfarina. The Rolls-Royce trademark grille was made wide and prominent and was also angled at 7° to make it look even more imposing. This was a car that was designed to look impressive yet sporty and artistic. It was created in an era when a large proportion of Rolls-Royce customers were entertainment industry celebrities and so Rolls-Royce were seeking to cater to the tastes of this new clientèle. Somehow Paolo Martin of Pininfarina managed to make that big ostentatious Rolls-Royce grille fit aesthetically with the rest of the car. For accomplishing what probably seemed an impossible task he likely deserved a medal. Paolo Martin’s design work for the Camargue was second to none. He managed to put together a car from what must have been a difficult design brief and he made his design work. 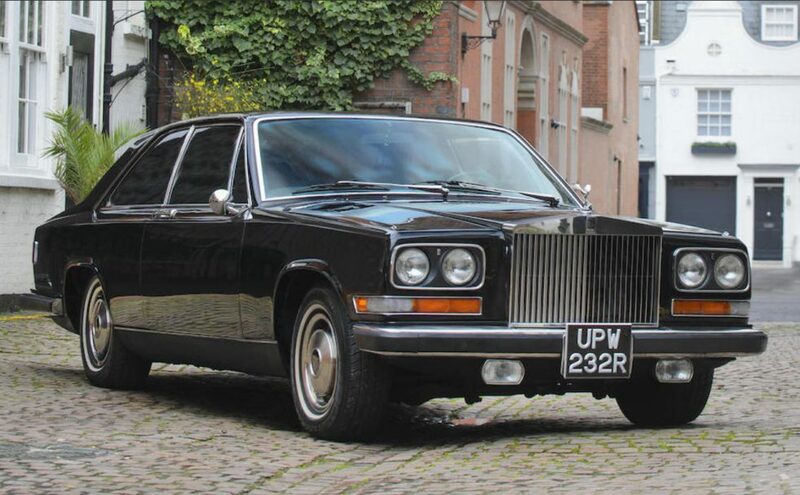 When we look at a Camargue we have to wonder how he managed to blend that big Rolls-Royce Grille into a lithe sporting coupe successfully and still capture the imposing air intended. He did it, and did it well. Paolo Martin’s body design is clean and very seventies aesthetic. Note how he has accentuated the line of the car under the windows with double accents to draw the eye away from the imposing Rolls-Royce grille. 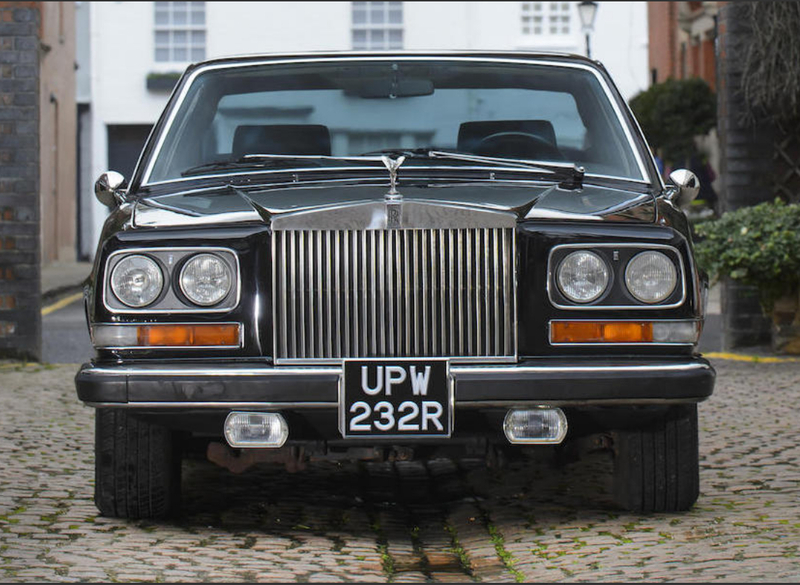 Back in the seventies a rich entertainer was expected to have a big car with a big engine and so the Rolls-Royce Camargue was fitted with the 412 cu. in. (6.75 liter) Rolls-Royce V8 breathing through two SU carburettors (or twin Solex in later models). Although this engine does not quite consume gasoline at the rate of gallons per mile it was a thirsty animal with a reputation for liking a regular drink, as some members of the Rat Pack did also. 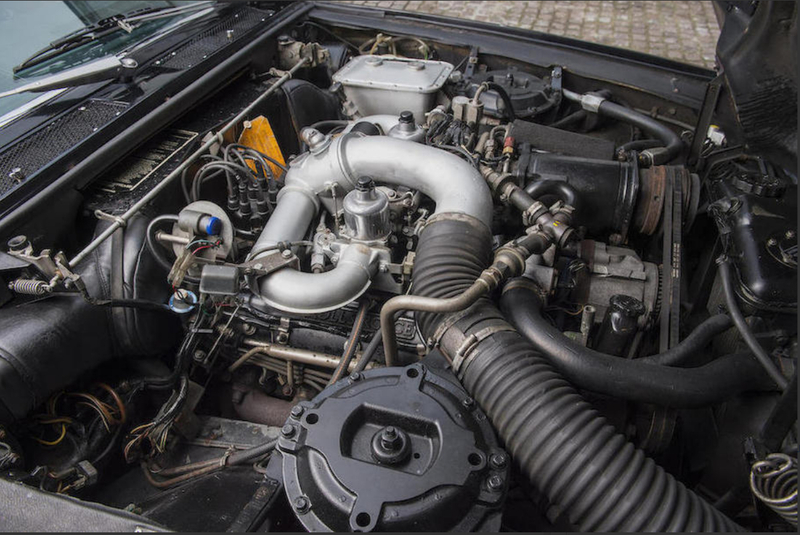 The 6.75 Liter Rolls-Royce V8 with its plumbing fills the engine bay quite completely. Woe to the mechanic who drops a spanner in there. The Camargue was fitted with a three speed General Motors Turbo-Hydramatic automatic transmission. 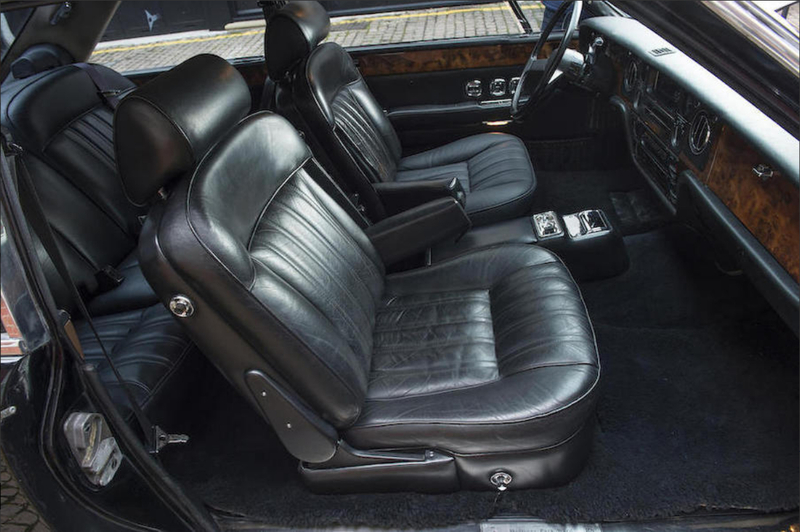 The car was built on the base platform of the Silver Shadow and Corniche but with the independent rear suspension of the Silver Spirit and the steering from the Silver Spirit II. Brakes were servo assisted discs all around. Seen from the rear quarter the Camargue is a very pretty car. This 1977 Rolls-Royce Camargue that was owned by Sammy Davis Jr. in the late seventies is coming up for sale by Bonhams at their Amelia Island auction to be held on 9th March 2017 at the Fernandina Beach Golf Club, 3990 Amelia Island Parkway, Fernandina Beach FL 32034. The car is to be sold without reserve and is estimated to sell for between USD$38,000-$46,000. So it may be possible to pick this car up for quite reasonable money. From the looks of the photos the car could do with some attention but looks sound and would respond well to some cosmetic freshening. This is a prestigious and unusual Rolls-Royce offered for a reasonable sum, and it has the original Rolls-Royce split level air conditioning with Blaupunkt sound system. It could make a delightful daily driver and/or road trip car. The split level air conditioning system took Rolls-Royce years to develop.